Yesterday I thought I would put together Lucy's bouncer because she has been holding her head up so well and because it looked like so much fun! 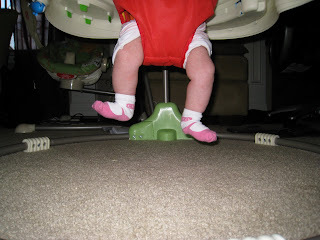 Little did I know that she would not be able to touch the ground to bounce or play with any of the toys. She just hung in it and after hanging for awhile she told me to get her out. Lucy looking so cute in her bouncer! Lucy hanging about eight inches from the ground! Yesterday we also went over to Aunt Laura's house so the girls could have a play date! 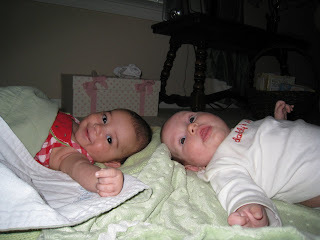 The girls love to lay around together to discuss their favorite nursery rhymes and bedtime stories. 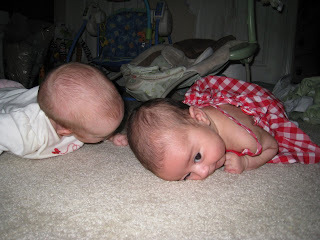 Lucy and Emma having alittle tummy time or a head raising contest! Cute, cute, cute!!! 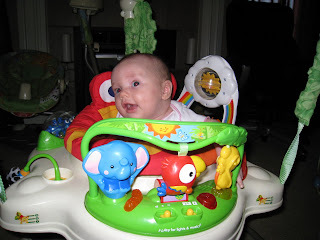 She looks normal in the bouncer, until you see the next picture. Funny!!! It won't be long until she is jumping like crazy. I love the grin on Emma's face. She looks so sweet and mischievous at the same time.